Complete Plant Keto Blend Natural Flavor, 10.23oz/290g (PlantFusion) - Penn Herb Co. Ltd.
Just because something is “low-carb” or “keto” does not mean it’s healthy. Whether you are a committed ketogenic dieter or just someone who wants to move away from sugar and carbohydrates, it’s possible to lose weight and be healthy at the same time with proper nutritional balance. Our 1:1 Fats + Protein is completely different from any other keto product in that it contains seven different sources of healthy fats from natural foods like avocado and coconut. We balance that in a perfect one-to-one ratio with premium plant-based protein. This balanced ratio of fats + protein helps manage your hunger while providing sustained energy. 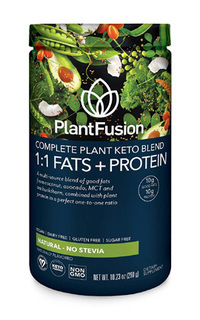 And like all PlantFusion products, it’s 100% plant-based, allergy-free and non-GMO.